Ozeki NG SMS Gateway makes it possible to send SMS notifications to mobile devices from your PC. If you have an e-mail alerting system or you use mail clients and would like to add SMS functionality to it you just need to configure the e-mail server (SMTP server) of Ozeki NG SMS Gateway to send your e-mail messages to mobile phones by converting them into SMS messages. This article explains how this solution works and how it can be configured. SMS sending is one of the quickest and easiest ways of communication today. Its simplicity is welcomed also by business and everyday life. Today it is more and more common that corporations use SMS in their dealings. Beside SMS messaging, the other popular possibility is e-mail sending. It is widely accepted as a written form of communication in businesses and important letters, notices, etc are sent in emails. Today e-mail alerting systems are also quite common in organizations. These systems enable administrators to be informed about malfunctions occurred on computers. Now you can make your IT environment safer and more effective with the use of Ozeki NG SMS Gateway to add SMS functionality to your e-mail alerting system and mail client. Therefore, the two popular messaging methods can be connected in a very effective way. With this excellent function Ozeki NG SMS Gateway operates as a two-way E-mail SMS gateway software. It enables you to get an incoming E-mail as an SMS text message on a given phone number or phone numbers. This means that you or the administrator can be informed immediately about errors and it does not necessary mean going to the server room or even to the computer to get information about the difficulties. You can enjoy the benefits of SMS sending from your computer. The received SMS makes immediate and proper interaction possible, so you can prevent further damages or system breakdowns. On this page you can learn more about this function, about the options how it can be realized and about the configuration of Ozeki NG SMS Gateway to be able to forward these e-mails as SMS messages. The main advantage of this option is the fact that it is very simple. The SMTP server receives messages only if it is enabled. The messages are sent to an e-mail address containing a phone number such as: +441234567@192.168.0.10, where +441234657 is the phone number and 192.168.0.10 is the IP address of the SMS gateway. The subject and the body of the e-mail will be sent to the given phone number as an SMS message as it can contain text. This process will be explained in Figure 1. To make this function work you need to configure 192.168.0.10 as the SMTP server for the computer that sends the e-mail (192.168.0.11). You need to configure the built-in SMTP server of Ozeki NG SMS Gateway to forward e-mail messages as SMS text messages. To do so, open the server preferences form in the edit menu (Figure 2). Now select the E-mail to SMS tab, and check the Enable the built in SMTP server in this tab. Click on OK.
After this setting, please restart the Ozeki NG SMS Gateway service in the control panel/administrative tools/services form or restart your computer. You can also verify that the SMTP server is running by the telnet application of Windows. Open a command shell and telnet to port 25 of your computer. 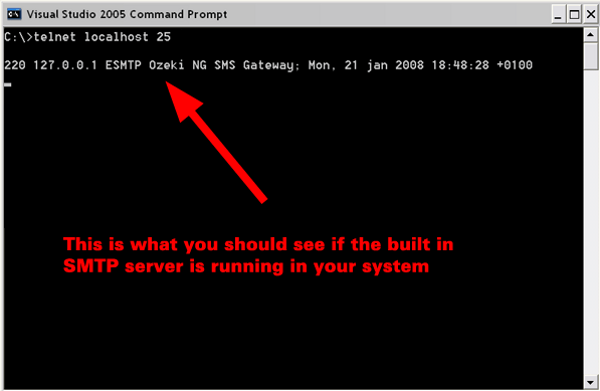 If you see a greeting message of Ozeki NG SMS Gateway it means that the SMTP server is running (Figure 3). The other possibility is if you use the e-mail server (mail.company.com) of your company to receive e-mail messages from your PC (192.168.0.11) and to send e-mail messages as SMS messages to the built in SMTP server of Ozeki NG SMS Gateway (Figure 4). It enables your computer to send standard e-mail messages and e-mails as SMS messages at the same time. You need to enable the SMTP server to receive messages similarly to the previous option, and the format of message sending will be +441234657@sms.company.com. The subject and the body of the e-mail will be sent to the given phone number. But in this case in your computer (192.168.0.11) you need to configure the mail server of your company as the SMTP server. If you choose to use this setting then you need to make a DNS entry which points to your gateway such as: (sms.company.com -> 192.168.0.10) because most of the e-mail relays of companies will not forward e-mail messages to IP addresses. This means, that the +441234567@192.168.0.10 will not be a valid address, you need to use +441234567@sms.company.com instead. You need to configure the built-in SMTP server of Ozeki NG SMS Gateway to forward e-mail messages as SMS text messages in the same way as in the previous option. To do so, open the server preferences form in the edit menu (Figure 5). Now select the E-mail to SMS tab, and check the Enable the built in SMTP server in this tab. Click on OK.
You also can verify that the SMTP server is running by the telnet application of windows. Open a command shell and telnet to port 25 of your computer. 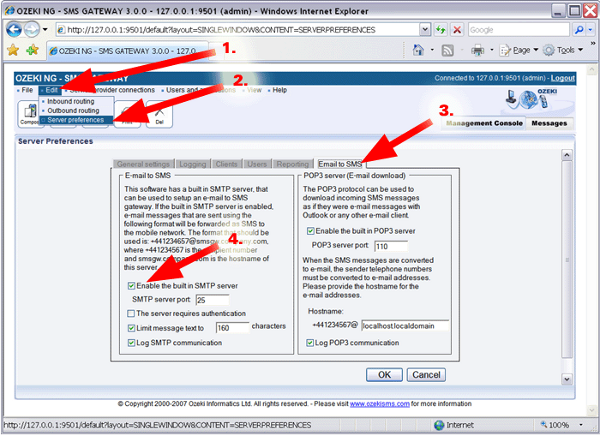 If you see a greeting message of Ozeki NG SMS Gateway it means that the SMTP server is running (Figure 6). The third possibility is if you create a mailbox on the company's mail server and the Ozeki NG SMS Gateway is configured to download new messages from it in a certain period of time and send them as e-mail messages (Figure 7). In this option you can send these messages to the same address such as: john@mail.company.com and you need to provide the telephone number in the subject line of the e-mail, so the body of the message will be sent in the subject line as an SMS message. If you would like to configure this solution you need to create an e-mail user in Ozeki NG SMS Gateway to download the messages. Please make sure that the downloaded messages are deleted in order to avoid sending them more than once. 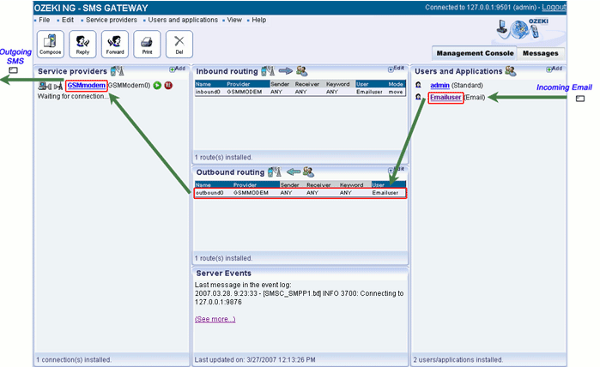 In order to configure your SMS gateway software to send E-mail messages as SMS text messages, please follow the guide below. First you need to verify that you are able to send SMS from the account of the admin user over the GSM modem connection. To do so, please click on the Compose button in the Management console and write then send a message to your phone number. Next, you need to configure the outbound routing. To do this, add an out bounding routing rule in which the source is the E-mail user. To learn more about adding and editing an outbound routing rule, please, check the Outbound Routing page. After adding the rule, the automated E-mail user will convert an incoming e-mail into an SMS message, and this message will be sent by using the GSM modem connection (Figure 8). You also need to make the E-mail to SMS configuration in the E-mail user of Ozeki NG SMS Gateway. Here, you need to define information related to POP3 server. For further details of configuration steps, please, visit the E-mail to SMS Configuration page. Finally, you can test your software: you just need to send an e-mail to the POP3 server from Outlook Express and the Ozeki NG SMS Gateway downloads it as an SMS message.